Best Flooring for Basement. Basement is a room in your home which can be used for many purposes. Some home owners are using the room as storage room. Other home owners simply use the room for entertainment or health purpose. 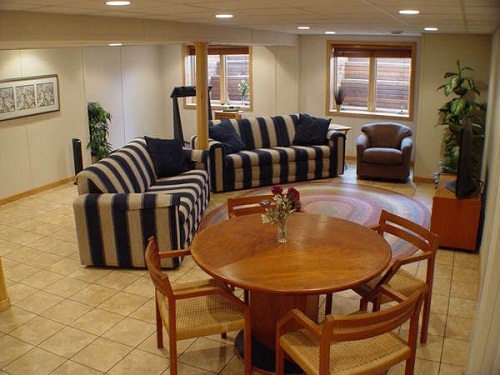 No matter what plan which you have for basement area, it is important for you to find the best flooring for basement. Flooring option is available widely in the market. It is important for you to consider some aspects before purchasing the flooring. These aspects help you to find the best option for basement flooring. 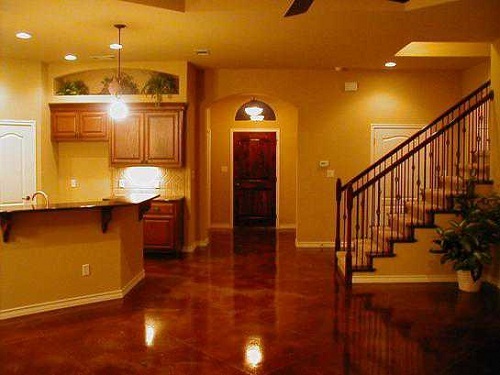 In finding the best flooring for basement, you should consider installing concrete flooring. This flooring is more recommended for home owners who have basement which floods. Concrete material is designed to be hard and durable. This versatile flooring option has the ability to resist water damage much better than other flooring options. Concrete flooring option is highly recommended for home owners who have basement which experiences water logged problem once a while. Some people mistook the concept of concrete flooring. They think that installing concrete flooring means they should stick with cold and gray concrete floor. 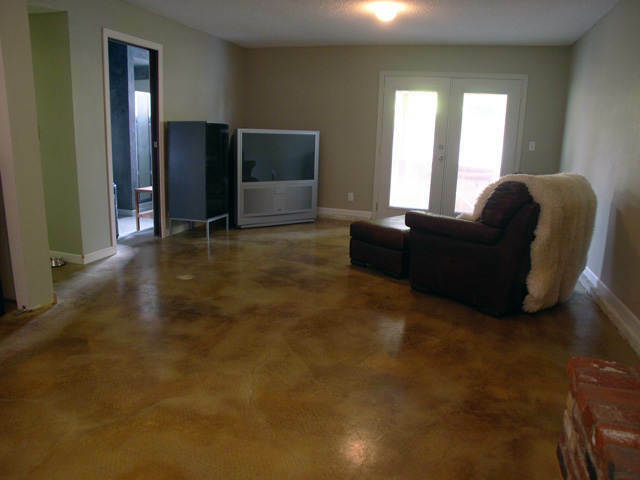 The good news is you are able to stain the floor in any color by using concrete stains. These stains help you to get smooth and finished appearance. The only disadvantage of the flooring is cold feeling touch. If you are installing the flooring, you are recommended to use rugs or carpets. Concrete flooring is best used if you are planning to transform your basement into gym or spare bedroom. Another flooring option which can be the best flooring for basement is sheet vinyl. The flooring is suitable for home owners who have low to medium moisture problem. The main benefit of the flooring is versatile texture. Vinyl flooring has the ability to withstand rough usage. Another advantage which you can get from this flooring is light maintenance. When you are installing this flooring, you will add beautiful touch to your basement. The flooring is suitable for any basement purpose. If you do not have any idea on what you will do with your finished basement, vinyl flooring can be safe option. Laminate flooring should be included to your list when you are looking for the best flooring for basement. This flooring is only recommended for home owners who have low moisture problem. Many home owners are more interested in installing this laminate flooring since it provides the same visual effect as hardwood flooring. However, it offers less hassle for the installation and maintenance. Install laminate flooring if you are using basement for offices and bedroom. You can also install laminate flooring for basement theaters since laminate flooring offers the ability to absorb the sound from the system. It is also good idea for you to install ceramic tile. Ceramic tile has been popular among many home owners. This flooring option is loved by many home owners since it is affordable and useful. Home owners will be able to install and maintain the flooring easier. Ceramic tile is also resistant towards water damage like concrete flooring. Other good options for your basement are including rubber flooring, epoxy, stone, and much more. 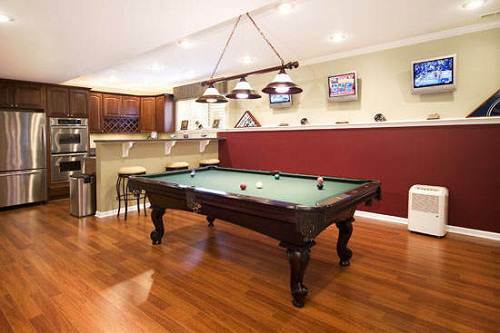 With these options, it will be easy for you to find the best flooring for basement.